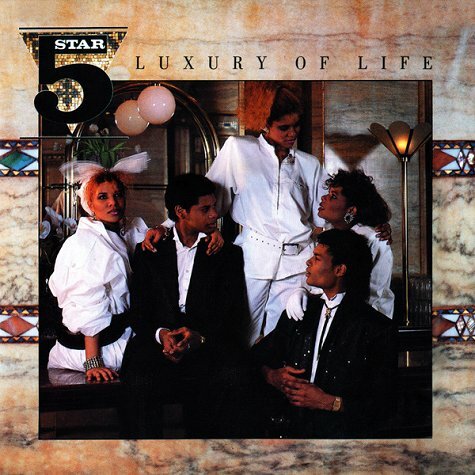 Today’s POP RESCUE from a loveless future, is the 1985 debut Five Star album Luxury Of Life. This album saw the five Pearson siblings (Denise, Doris, Lorraine, Delroy, and Stedman) launch themselves as a kind of group alternative to Michael and Janet Jackson. Musically and stylistically, there are many similarities. First up is single Love Take Over, which was mixed by in-demand producer of the time, Paul Hardcastle (who had had a hit with the single 19). This is a great start to an album – strong and up-beat – vocally and musically. Following this is All Fall Down which, like third track Let Me Be The One, are great little pop songs. They both remind me a fair bit of something that you’d hear from Janet Jackson. Next up is one of the two best Five Star tracks (in my opinion) – System Addict (the other being Rain Or Shine from their Silk & Steel follow-up album). This is a great song – complete with a brilliant robotic video, and whilst it cries out for a cover version, it’s difficult to imagine where a cover version could take it to – as it’s perfect. The fifth track was their debut single – Hide And Seek and it’s a perfectly respectable bouncy pop number, that’s a good a place to start as any. This track was co-written by Anne Dudley – now a famous composer and producer, but at the time she was a member of Art Of Noise. Bouncing in with a fill, R.S.V.P has a great bassline, and a beat and tempo that could probably allow you to mash it up with Madonna‘s Into The Groove with great ease. This track is the perfect up-beat little pop track. ‘I can make you number one, if you to have my love’ they sing. I think that this could have easily been yet another hit single from this album. Track seven, Now I’m In Control, reminds me a little bit of System Addict. Once again, this is the perfect little pop gem – catchy and up-beat. Strings open Say Goodbye, a track written by group member Lorraine. It’s a slow, tender ballad, with some delicate vocals, over a piano, cello, and acoustic guitar before a beat joins them. Penultimate track Crazy is a catchy pop number, with some fantastic high-pitched vocal samples and vocal harmonies. Final track is Winning, and yes – they are! Its chorus is catchier than its verses, but the bouncy bass, synth, and brass sections keep it bouncing along perfectly. This is a fantastic album. It is flawless, even now – 29 years after it was released. And for a debut it really set the group up for a successful career. Despite releasing 7 singles from this, they managed to find time to record and release their second album in the following year. Where are Five Star now? Five Star went on to release a number of albums until monetary problems and record label tensions forced them to relocate to the US. After a hiatus, they returned to touring in the US and UK, turning up at festivals and holiday parks. Cherry Red Records recently re-issued this album and others with extra tracks. Posted in 1980s, Five StarTagged 1985, 5 Star, album, Anne Dudley, Deneice Pearson, Hide And Seek, Lorraine Pearson, Love Take Over, Luxury Of Life, Paul Hardcastle, review, System AddictBookmark the permalink.